First thing we need to do is pass on this LIGO announcement heads up from Searching for Gravity Waves, Dr. Gary. Thank you Gary. in Gizmodo is that LIGO will announce the detection of two black holes. Thank you Ken. Of course, I have no idea what the announcement will be, but I'm chilling down a bottle of champagne just in case. If they announce a big discovery, I'm set to celebrate. If they don't announce a big discovery, I'm set to celebrate that too. In either case I'm set. 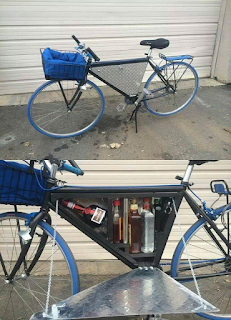 By the way, Moved out to sunny Florida, Bill, sent in a photo of a new bicycle design specifically adapted for use in occasions like this. 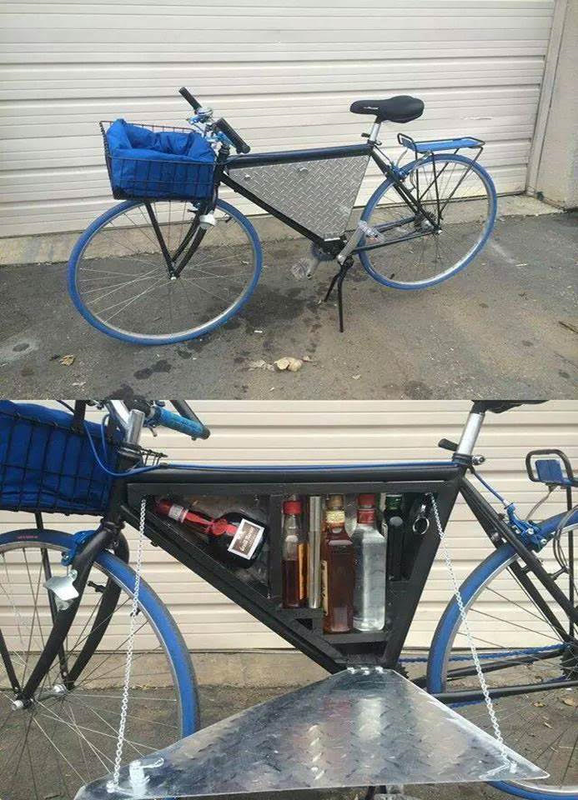 Check out the accessory rack on this bike! Thanks Bill. Ok, ok, enough of that stuff. It's time to take off the physicist wannabe hat and put on the amateur astronomer wannabe hat and show the latest lesson learned from astrometry. I used an image of Jupiter and three of the moon's as a test case. So what does all of these screenshots and print outs mean for the amateur? 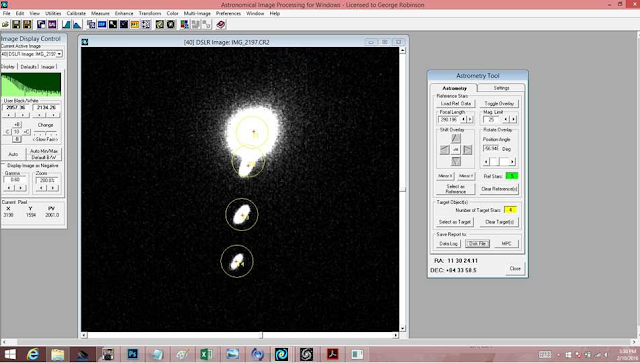 This shows that an amateur could take an image of some celestial object and use very accurate star charts to get very good estimates of the objects positions that could be used by other astronomers to find and verify the object. But all of this effort so far is just trying to develop the capability of collecting the images and doing the position estimation. Nowhere, have I verified that my estimates are correct. But if the locations of the moons of Jupiter can be found in separate reliable sources then the calculated positions could be checked against the published positions. So where can we find this information? 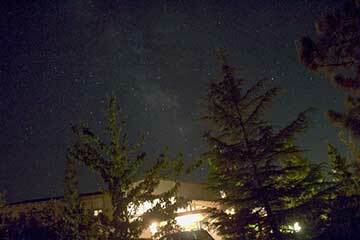 For example, I have no idea what the names are of any of the three moons captured in the image. I have an estimate of their position at one point in time, but what name goes with what image? It's not even clear if the moon shown being closest to Jupiter is indeed in the smallest orbit, which would mean it's name would be "Io". We don't know for sure because one of the moons in a much larger orbit could just by chance appear to be very close to Jupiter. How will we know? 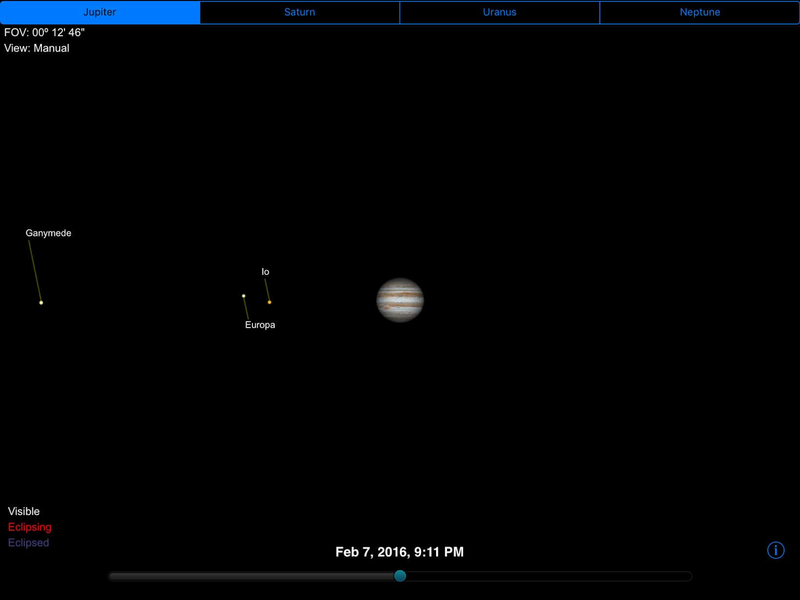 My first step was to use one other app on my IPad that shows the positions of some of the moons of the gas giants. The screen shot from that app is pasted below. Ok, know at least we can identify the names of the objects. The remaining problem of comparing the calculated positions to actual positions still needs more effort. This case is not like what I did last week for stars, because the stars that I picked were already in the star catalog so I could check the calculated position with the published position for that star. Well, I'm done for now. I'm worn out and waiting for that announcement and champagne. So I'm looking for a reference library that lists the published positions of the moons so the estimates can be compared? The orbital period of the moons, in this test case at least, are very short, just measured in days, so calculating their positions will not be easy and seems to need to be computed for each observing time. If you know where to find this kind of data let me know.